The Cuisinart 726-38H chef's classic 14 in. stir fry with handle is ideal for high-heat stir-frying with minimal oil and sears foods to seal in flavor, texture and nutrientshigh-heat stir-frying. It has 18/10 stainless-steel construction that won't react to acidic foods and includes an inner core of aluminum to ensure foods heat quickly and evenly. The cookware's riveted stainless-steel handle stays cool on the stovetop, while its lid seals in moisture and nutrients for healthier, more flavorful results. The Chefs Classic Stainless 14In Stirfry Hlpr Hndl/Glass Cover has many exciting features for users of all types. 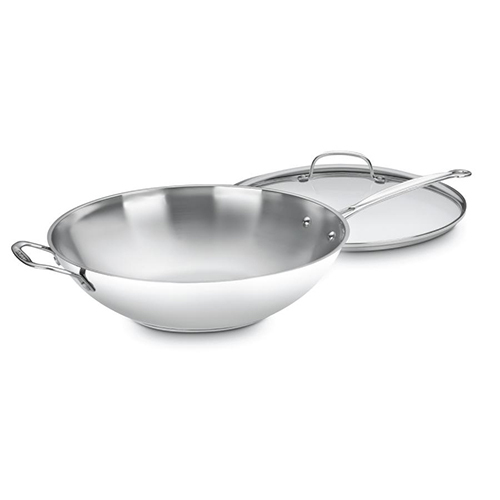 See the Chefs Classic Stainless 14In Stirfry Hlpr Hndl/Glass Cover gallery images above for more product views. The Chefs Classic Stainless 14In Stirfry Hlpr Hndl/Glass Cover is sold as a Brand New Unopened Item.